Madeline is allergic to everything. In fact, she hasn’t left her home since she was about four months old. She spends her days with Carla, her nurse, and her evenings with her mother, who is a doctor. Everything in her life is sterilized and according to a strict routine. She’s not unhappy– this is just the hand she’s been dealt, and she has a good attitude about things. Then Olly moves in next door, and suddenly Madeline wants more. Olly is adorable. So is Maddy. Their IM conversations are hilarious and flirty and fun. I just love them! Initially, I didn’t want to read this book because– looking at the book description– I thought, “There’s no way this can end well.” Then I read a review that essentially said, “Just trust me. Read it. It will be okay.” So I did. I really loved the characters in this one (obviously), though I was a little put-off by Maddy’s selfishness in some situations– but I gave her grace because she’d been unselfish for her whole life, ya know? Early on, I guessed the twist. Then, stuff happens and I thought, “Oh, I guess I was wrong.” But I was right in the end. All in all, this was a great, happy, interesting, sad (at times) novel that I really enjoyed reading! If you’re nervous about the ending, don’t be. Just read it. 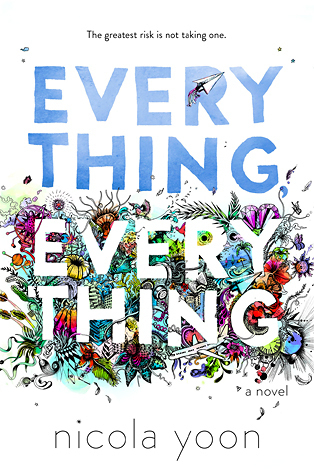 This entry was posted in book review, everything everything by nicola yoon and tagged book review, everything everything by nicola yoon by Jackie Lea Sommers. Bookmark the permalink. Oh my gosh. The twist. At first I saw it coming and then I was convinced it wouldn’t happen, and then it did happen in such a crazy way. Overall I was impressed with how the book felt very quiet for the first half, then became so fast-paced but still felt cohesive. Loved this book! I’ll admit I was a little stunned by Maddy’s selfish behavior! Also, SPOILER why would Carla not stop her from going to Hawaii if she really thought it would kill her? That seems pretty irresponsible for a nurse, right? All in all, I liked the book and LOVED Olly … but those were things that stumped me a little! See I didn’t think what Maddy did was that selfish … although I can see how you might read it that way. I thought it was the only way for her to take control of her life and that kind of showed her growing up. I was also pretty stunned by Carla’s behavior that’s what make me really sure that SPOILER she wasn’t really sick and Carla suspected this, which I had suspicions about really early because the mother’s behavior and lack of another doctor to consult seemed really strange, but then the SPOILER AGAIN sickness she got on Hawaii made me think I was wrong and feel guilty for doubting the mom … which made the news at the end all the more satisfying because I’d been faked out so many times. Also LOVED Olly, but definitely see what confused you about Maddy’s behavior – even though that’s not what I was thinking while I was reading. Agh! This book. I freaking loved the ending. Like, the very last chapter in the bookstore. That was adorable. I was torn over the twist, though! I guess I didn’t pick up on it at any point throughout until Maddy started piecing it together herself, at which point I was shocked. But I really enjoyed it overall – the illustrations were perfection, and there were definitely some great laugh out loud moments. LOVED that last chapter in the bookstore. What a perfect way to wrap it all up! I was suspicious of the mom the entire book … all the way up until Maddy had her breakdown in Hawaii, at which point I was like, “Okay … so maybe this IS real.” It’s really strange for me to guess ahead … I’m usually so wrapped up in things that I don’t think through the twists!